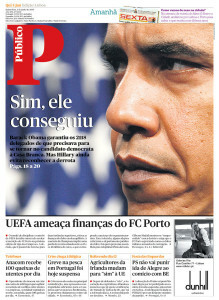 Apropos of newspaper front pages (see previous post), I want a daily paper that looks as great as Portugal’s Público. This entry was posted in Uncategorized on June 5, 2008 by lance. The Sunday FAZ is consistently brilliant. Not just front pages — for June 1, they turned the Telekom T upside down, deconstructed it and didn’t run any other photos on the front page. Wowee. And the two-page spread they do in the center of their Science section is gorgeous and enormously informative. There are all the little clever bits they add, too: teasers that all relate to each other, unexpected illustrations, and much more. Much as I love the weekend FT, the Sunday FAZ is better. Pity it doesn’t carry over to their web site, though. 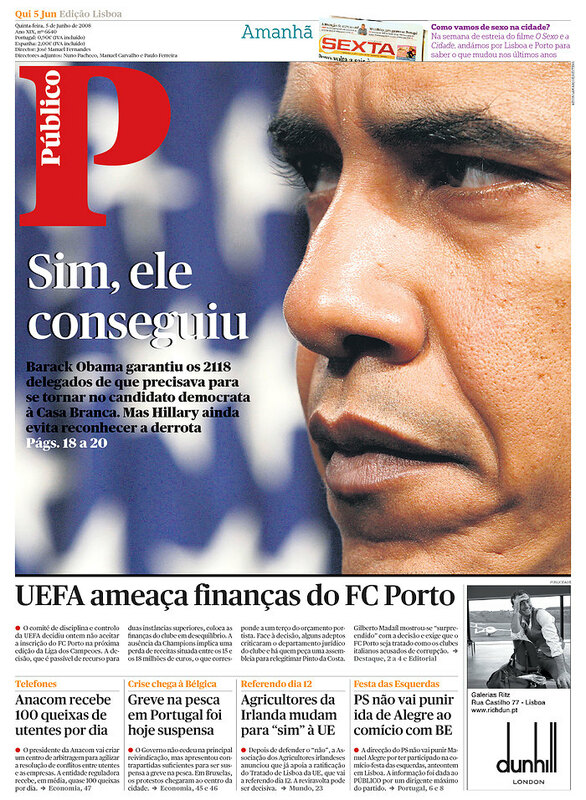 The Portugal’s Público looks interesting and I would love to see how the inside too looks like. I am in Kenya and a designer. Do you mind sending me any of this paper complete PDF. Thank you.